HARRISBURG, Pa. (AP) — Pennsylvania Gov. Tom Wolf will attend the invitation-only national funeral service for former President George H.W. Bush in Washington, D.C.
Wednesday's funeral service is at the Washington National Cathedral. Bush died on Friday at age 94 and is lying in state in the rotunda of the U.S. Capitol on Tuesday. KENNEBUNKPORT, Maine (AP) — Former Prime Minister of Canada Brian Mulroney will stress the importance of a strong bond between his country and the United States even during times of disagreement during a speech in Maine. A copy of the speech was provided to The Associated Press before the Friday night event. 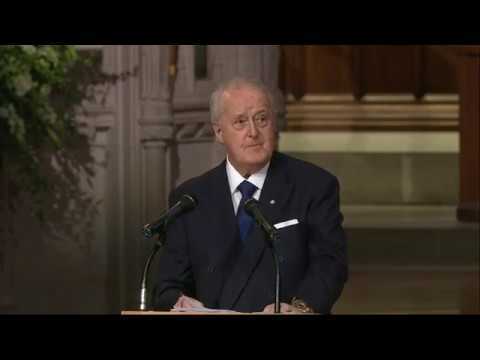 Mulroney says NAFTA "did not just happen by accident" and was the result of "leadership and vision" by President George H.W. Bush. QUEBEC CITY (AP) — President Donald Trump is cutting short his first presidential trip to Canada this weekend, as trade and foreign policy disputes appear set to mar his planned summit with the leaders of the Group of Seven wealthy democracies. QUEBEC CITY (AP) — When President Ronald Reagan visited Canada, he was so friendly with Prime Minister Brian Mulroney they sang a song together. Expect no duets when President Donald Trump makes his first presidential visit to Canada on Friday for a summit in a picturesque Quebec town with the leaders of the Group of Seven wealthy democracies. The atmosphere will likely be something less than harmonious. San Antonio took the spotlight when the North American Free Trade Agreement was ceremonially signed here almost a quarter of a century ago, and a bipartisan group of South Texas lawmakers is pushing to have “NAFTA 2.0” signed here again. U.S. Reps. Henry Cuellar, D-Laredo, and Will Hurd, R-Helotes, on Friday said that whatever happens during the renegotiation, they already had bids out to bring the revised free trade agreement between the U.S., Canada, and Mexico back to its hometown.